Tucked in the Western Highlands of Guatamela is one of Central America’s most beautiful volcanic lakes called Lago de Atitlan. Atitlan Lake majestically rests at the top of the Toliman volcano, boasting an altitude of about 1,560 meters. Because of its pristine beauty and very serene environment, Lago de Atitlan has been a favorite destination among travelers especially the backpacking communities, and some have even called it the most beautiful lake in the world! Atitlan is known for its purity and blue hue. It is an ancient place rich in history. The descendants of the Maya civilization that flourished in this region, still call Atitlan their home. Here, they continue live off the land and have maintained their traditional maize farming methods; as a way of honoring the past and their ancestors. Visitors to Lago de Atitlan are given the nice opportunity to choose among the cool towns that surround the lake. If you decide to go for the most well-known, Panajachel should be your number one choice. It is the most visited town in the region, perhaps mainly due to it being a transport hub. Panajachel is the place where you will most likely meet and make connections with like-minded travelers. However, you are not obligated to stay Panajachel for the entirety of your visit here; unless you only have a couple of days in the Lake Atitlan region. Atitlan’s San Pedro La Laguna is the ideal town for those who prefer a more-off-the-beaten-path location. This is where people head to if they want to get up close or possibly hike the San Pedro Volcano, which splendidly overlooks the town. If you are seeking the ideal meditation environment, then the town of San Marcos makes an excellent choice. 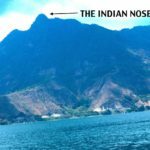 One of the main attractions in Lake Atitlan is the formation called Indian’s Nose, situated at the top of the mountain that soars above the cities of San Marcos and San Juan. Hiking designated tracks is the only way to access this rich site. If you don’t want to do this journey alone, you can sign up for an organized trip to the Indian’s Nose and join a group. This kind of trip usually involves traveling by horseback to reach the top. 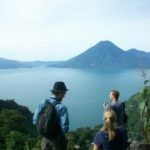 Aside from hiking to Atitlan’s volcano, there are also other types of excursions that you can do while visiting Lake Atitlan. Examples of these are village tours, bike tours, coffee tours, and bird watching tours; all of which have the potential to tickle your fancy and provide delightful memories. On the lake, visitors tend to kayak or go for an exhilarating jet ski. Another interesting thing to know is that there is also a lakeside path that encircles the whole of Lake Atitlan; but it is not well-marked. Despite this, a number of visitors are not dissuaded to giving it a try. Those who have made the effort, so far, have given positive reviews about the entire trekking experience. The last activity that is highly recommended and unbelievably basic is to just jump into the crystal waters of the Lake Atitlan, and enjoy a refreshing swim under the warm sun. To get around Lake Atitlan the most scenic way is hop on one of the small boats (locally called lancha) to cross the lake. Some of these boats can be hired privately; while others accumulate passengers to their maximum capacity before going from pier to pier. Take note that there is no official schedule for these boats. 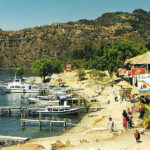 However, the public boats that connect Panachel to towns like San Pedro and San Marcos, come and go every half an hour. For a map of Guatemala, click Here!